A two-in-one dose of double joke trouble. If you think Henry’s joke books are dangerously funny, this one’s doubly dangerous! Yikes! 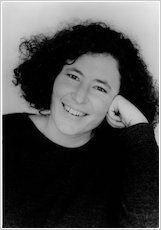 After the storming success of Horrid Henry’s three joke books, arch-rival Moody Margaret is striking back. It’s Margaret’s mean gags vs. Henry’s cruel corkers, and what a battle it is! The two foes let loose in a fight to the end, each unleashing their most side-splitting puns. With their friends, enemies, families and teachers cheering and booing along, it’s a hilariously horrid showdown! 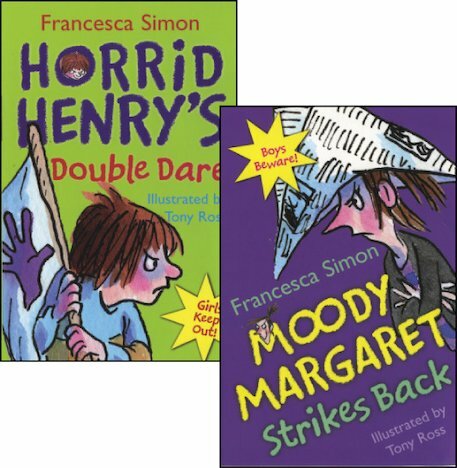 This 2-in-1 pack contains two joke books: Moody Margaret Strikes Back and Horrid Henry’s Double Dare. cheesy jokes but 2 books for that price is very good! this is an hilarious funny book mainly for children….......... it made me wee my pants it was that funny!!!!! this book is good!i’ll tell you a joke!Q.what has a spine but no bones? this book was ok but i dont like horrid henry. I have read this book and i thought they were just brilliant!! I realy love Horid Henry books and i have nealy read all of them. Theese books are awsome, they even come with a free wopee cusion! heres a joke from one of the books: Q-How do you catch a rabbit? A-Hide in the bushes and make a noise like lettuce! this book is a great book and all the jokes are funny and horrid henry dares are the best. I liked the part when horrid henry baffled beefy bert.